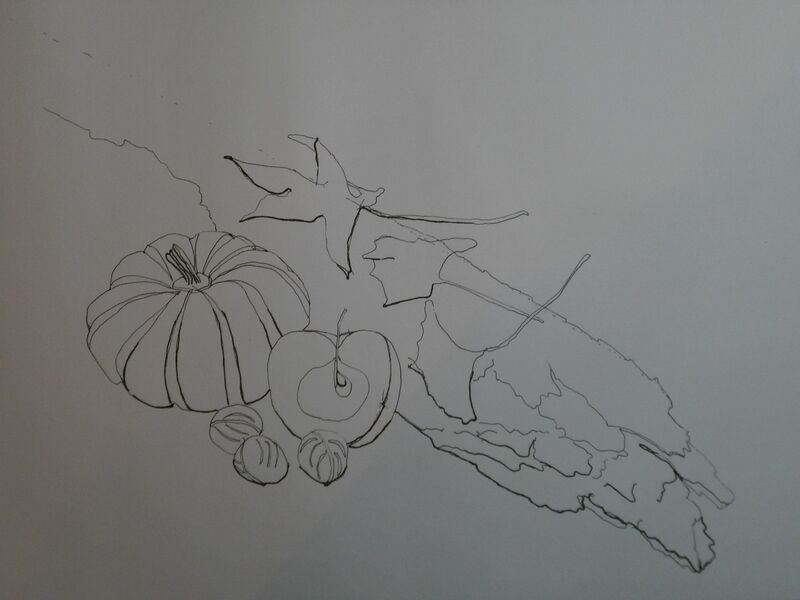 This still life group included a large slab of unidentified bark found beside a forest path, a cut apple, walnuts and leaves from maple and gingko trees. There is still a gingko tree down the road, clad in its bright green-gold, even in this last week of November. 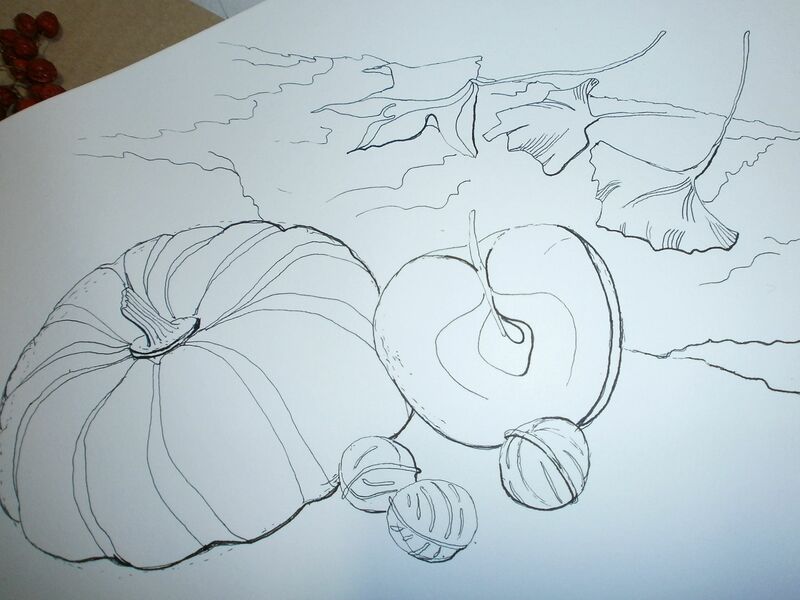 I then modified the image to include a cut apple and drew a preliminary sketch in outline. This time I paid a bit more attention to scale, although the pumpkin is still too small. 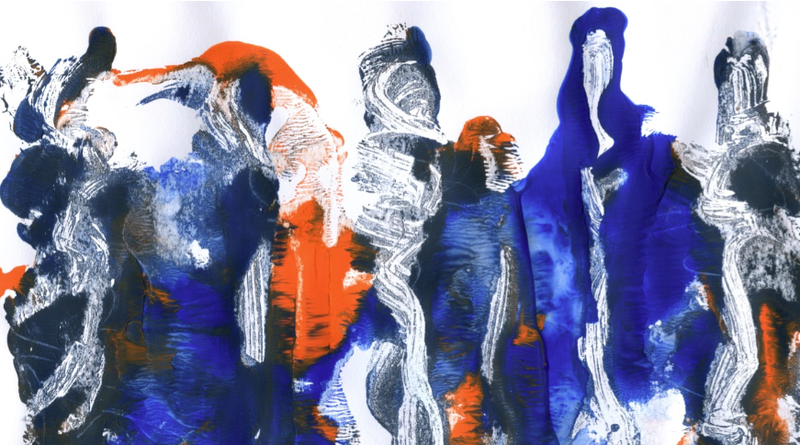 I drew heavier lines on the edges that were in shadow – care was needed to blend this thicker line seamlessly into the finer line. It was difficult to place the leaves accurately on the bark and to create a sense of movement and balance. I tried to simplify the bark as this is a line drawing and I did not want the bark to dominate, even though it is the largest object in the composition. The final drawing is larger and has better proportions. 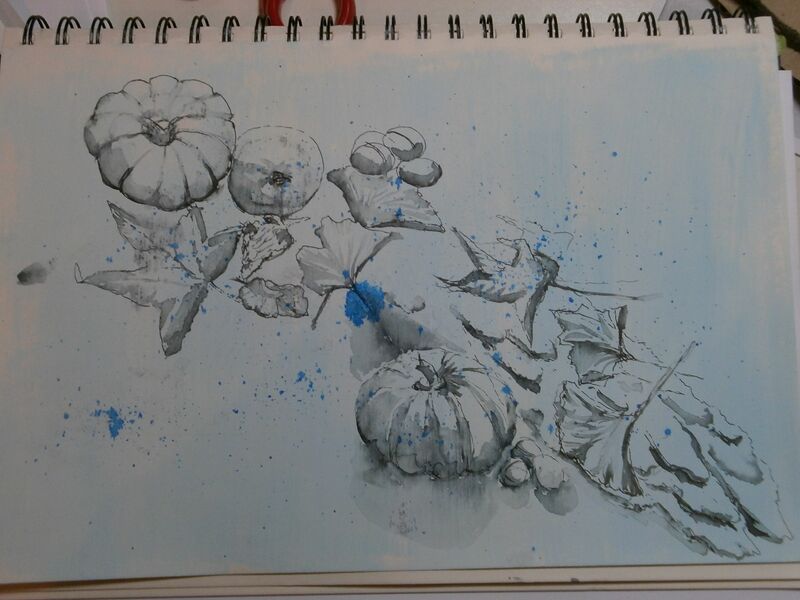 I drew the leaves first and then placed the bark and other objects around it in an anticlockwise direction, finishing with the pumpkin. I found this easier and the leaves look lighter and quite delicate here. There are enough lines for interest and detail without confusion. 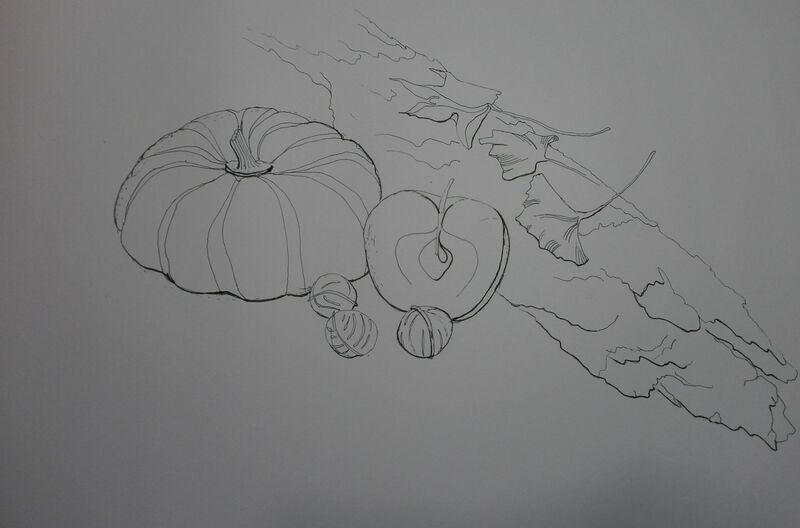 The pumpkin is a slightly odd shape but the difference in line creates energy in the drawing, although the outline of the apple on the right side should be a fine line, not two thicker lines together. The image is not central on the page …. yet again, I have not paid enough attention to the format. Finally, I took a close-up photograph of the still life group, just to catch it from a different angle and cut off part of it in the frame. Perhaps my drawings need to be more like my photos. Such lovely line drawings! I think the last observation, is especially thought-provoking, comparing the photograph and drawing, as one is so aware of “framing the composition” in a photograph. Right on.